PlayBox Neo TS Time Delay is UDP/RTP Data Delay server for single or multichannel Time Zone Delay, Regional Delays and Disaster Recovery applications. Designed for fully automated operation, Neo TS Time Delay can be configured with multiple input channels and multiple delayed outputs. Each input also has one zero-delay output. Provides fully transparent time delay of transport streams such as DVB/ATSC MPEG without changing the original quality of the content. All operating parameters are easily adjusted via an integral web-based user interface, including channel-specific time delay in 15 second increments. Maximum delay depends on delayed stream input bitrate and storage capacity. Additional features include programme information display of MPEG-compliant transport streams plus automatic error logging. Neo TS Time Delay incorporates UDP/RTP input/output, unicast or multicast via standard Gigabit Ethernet ports. 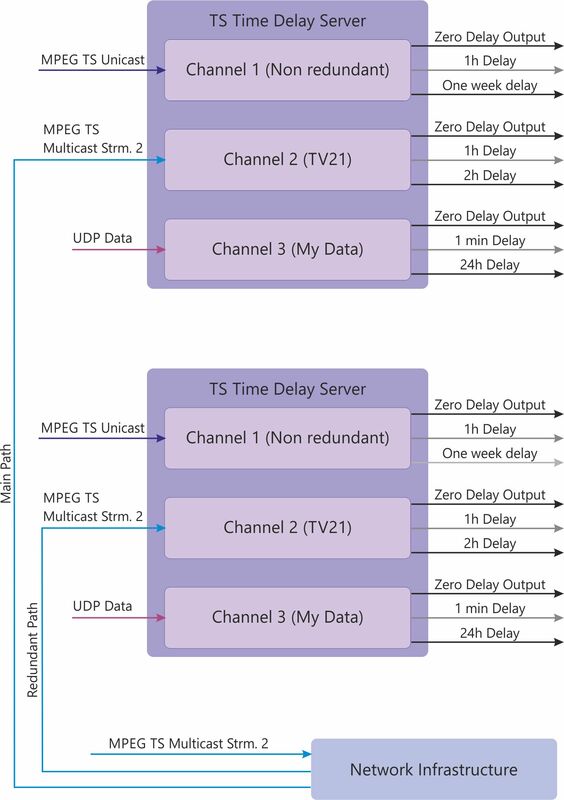 Delay for UDP/RTP unicast/multicast streams from a few seconds to week or more.